Philips SpeechMike Digital microphones. The best microphones for recording clarity and ease of use in multiple software solutions. Speechmikes are built to work with various software solutions from all kinds of manufacturers. The SpeechMike is a versatile and easily adaptible piece of hardware. 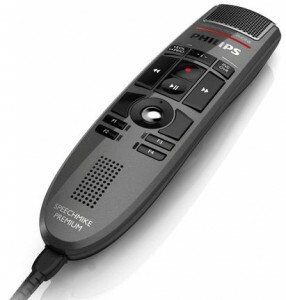 The SpeechMike Premium 3500/3600 series takes dictation to a new level. It may be the free-floating studio quality Precision Microphone, a microphone grille with optimized structure, built-in noise-reduction pop filter, antimicrobial surface or the world’s first motion sensor in a stationary digital dictation device. Available in push-button or slide-switch varieties. Attach client or patient data to a recording simply by scanning a barcode. (certain models). Five star Dragon Speech Recognition rating. The professional SpeechMike 3200 Series USB microphone delivers excellent speech recognition capabilities, an antimicrobial surface for improved hygiene, and refined ergonomics for easy operation. Comfortable ergonomic design for one-thumb operation. Attach client or patient data to a recording simply by scanning a barcode. 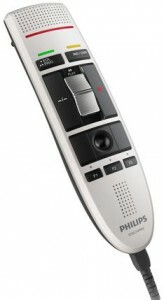 (certain models) Available with Philips SpeechExec professional dictation software. Can be fully integrated into existing workflow systems. Five star Dragon Speech Recognition rating.